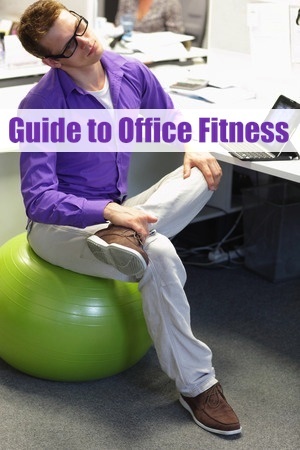 There are many ways you can sneak fitness into your workplace. Even the simple act of standing up will increase blood flow and burn off more calories than just sitting. Adding intermittent little changes or – for the more adventurous – adding office exercise equipment will increase your energy, focus, and calorie burning power. Becoming familiar with different ways of adding movement and exercise into your day will enable you to take advantage of those “hurry up and wait” periods. Like waiting for a meeting to start or even at the end of the day waiting for your ride to show up. Planning ahead for these moments will make a difference. Taking pride in your stride. This simple act of standing or sitting tall, shoulders back, and keeping your chin up does many great things for your health. At your desk it is a more ergonomic way to sit so you aren’t slouched and crumpling up those internal organs. On top of that it radiates confidence. One of the first steps to feeling great is to look great. When seated you should have your legs bent and not crossed. Feet comfortably flat on the floor so the pressure of your chair doesn’t dig into the back of your thighs. It is suggested by the experts to have a 110 – 135 degree angle in your hip joint. There are ergonomic office ball chairs and leaning desks made for this purpose for better health. If you have a regular chair there are other ways to keep the pressure off the back of your leg. You can try a footstool made with a angle or made to move. In the mean time, try setting some of those big office manuals no one reads under your feet. Keeping the neck in one position for several hours will lead to atrophy and other ailments. On top of this most people don’t sit correctly at their desks allowing the chin to jut forward placing pressure on the neck. Setting the timer for every 20 minutes to do some light neck stretches will help to ease the aches and pains caused by hours of motionless sitting. Along with stretching your neck take the time to do some shoulder rolls. This also helps with the neck as well as the shoulders. These are simply done by slowly rolling the shoulders in a small circle. First roll them forward for 10 times or more. Take a few seconds then roll them backwards another 10 or more times. If you are unfamiliar with this exercise you will actually feel it working and warming up your muscles. Do this slowly and stop if you have any pain. Shoulder rotations can keep “frozen shoulder” from forming or help to relieve it. However if you experience pain with this movement you might want to consult a medical provider. This will look a little weird but it feels oh-so-good! Grab the front edge of your desk with fingers pointing toward you. Thumbs will be out. Bend at the elbows and lean forward. Hunch so you are rounding your back, then let your spine relax and drop so you can push your elbows back and lean deeper into the stretch. Do this standing and seated. First seated. Sit tall and spread your arms wide. Point your thumbs up in the air and press your arms back as far as you can comfortably go. Now bed the elbows slightly as though you are about to give someone a big bear hug and close in on the hug. Do this a few times sitting. When standing for this make sure the feet are comfortably at shoulder width and you are standing tall and holding your abdominal muscles. Don’t hold your breath. Carpal Tunnel is unfortunately too common with knowledge workers. Caused by uncomfortable positions while carrying out repetitive motion of typing on a keyboard. One way to help is to replace your regular keyboard with an ergonomically designed keyboard. Regardless it is still recommended the wrist and forearms be stretched frequently throughout the day. A stretch can be as easy as holding your arms out in front of you, hands in a “stop” position and gently pulling back on the fingers of one hand using the other. Another thing to consider is to exercise the wrist to add strength and help with mobility issues. The treadmill desk is an expensive option to adding fitness into your office day. 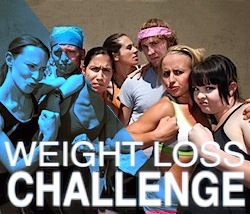 If you can budget for one you can burn up those calories and expect to drop up to 60 or more pounds withing the year if used for only 3 hours a day. Because of the price the average office worker doesn’t have the budget for a professionally manufactured desk. In lieu of this some people have opted to make their own DIY treadmill desks. Sitting in a chair will cause the lower back to stiffen and can cause pain. One way to stretch this area is while seated you can twist left and right. First be sure you are sitting up straight. Grab the right arm of your chair with the right hand. Place the left hand on your right thigh and twist toward the right. Very gently use your hands to deepen the stretch. Hold for a few seconds then do the other side. This one is tougher than it seems. Really – try it! Start by sitting at the edge of your chair nice and tall with both feet flat on the floor. Make sure your abdomen is tight but keep breathing. Lift your left foot 2 – 4 inches off the floor and hold. Don’t allow your body to lean to compensate. Make your leg and abdomen do all the work. Hold for 30 seconds if you can. Sitting all day leads to weak quadriceps and weak can mean your metabolism is slower. The legs are big and powerful muscles that can be responsible for burning off many calories. To help them stay active and revving up the metabolism the leg extension exercise is great. In your chair you need to sit up straight and hold in your core muscles. Keeping your body still raise one leg out in front of you. Add to the difficulty by raising the leg enough so the back of your thigh leaves the chair. Hold for a couple of seconds, bend your knee then lower your leg. Using a small exercise ball or even a water bottle. Something firm enough to take the pressure but soft enough so you don’t injure yourself. Place the object between the knees. Be sitting up straight with abs tight, feet flat on the floor. Squeeze the object between your knees tightly and hold for a few seconds. Relax and try again. These exercises and stretches will help to break up the long periods in one position. The main thing to remember is to make frequent changes to your position throughout the day. Stand, sit, walk, lean etc. Adding movement and exercise to the day doesn’t mean you have to sweat. A little does a lot.